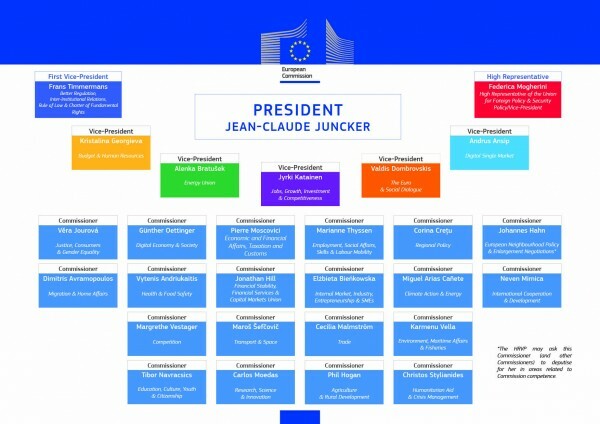 Jean-Claude Juncker, to take office as European Commission President on November 1 2014, has announced the names and portfolios of his commissioners. The announcement was made at a special briefing on September 10, following nominations by the 28 member states of the European Union and interviews by Juncker of each commissioner-designate. The list follows an earlier agreement among EU leaders on the appointment of Poland’s Donald Tusk as the next European Council President as of December 1, and of Italy’s Federica Mogherini who will take over from Catherine Ashton as EU foreign policy chief from November. The commissioners-designate will appear before MEPs for hearings ahead of a European Parliament vote on the Juncker European Commission.